Restaurant Starlu was a great eatery near my home. Their regular fare was a bit above my everyday price range, but they had a late night menu with a pricey burger and a couple of less expensive hot dogs. It sounded downright weird, if not disgusting to some. I grew up on peanut butter and banana sandwiches with mayo, so I was pretty sure that combo would be awesome. I love onions, so that might not be bad. And... well... bacon... Duh. 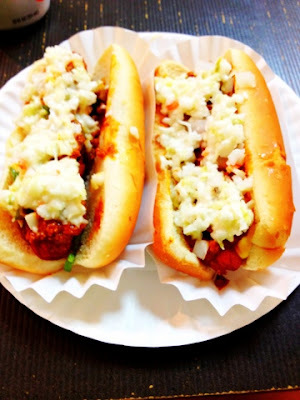 A few days ago, I searched Yelp for hot dog establishments in the area. I do that from time to time to keep up to date in my quest for the perfect dog. And what to my wondering eyes should appear but a new hot dog restaurant in Chapel Hill. 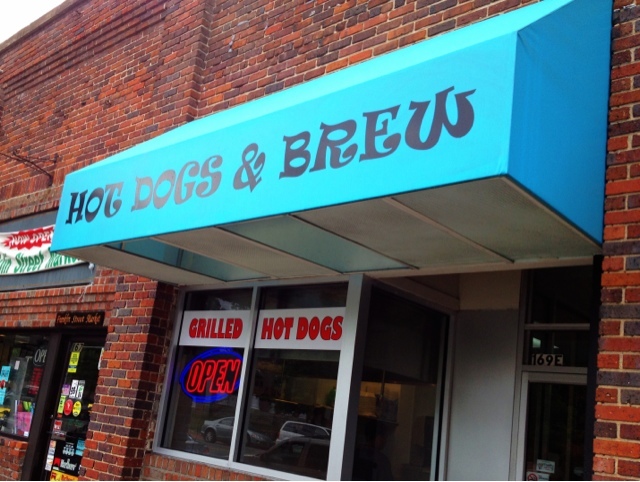 If you're a pedestrian in Chapel Hill, Hot Dogs & Brew is easy to get to, but if you drive, it takes a bit more effort to find a good parking space. I parked in the garage near the old Post Office and took Post Office Alley to get to Franklin Street. Other than having to pay for parking, not a bad place to park--when the garage isn't full. The store front it self isn't much to speak of: a blue awning with the name. The half windows sport a sign that reads "GRILLED HOT DOGS." It's clean and new, not much character... yet. Only the chalk sign on the sidewalk indicates this might be worth checking out. Inside, it's clean and spacious, a long room with tables and a couple of big screen televisions. Walking in, I felt a twinge of nostalgia. The layout is similar to the legendary Amos 'N Andy; the decor is not. It's much brighter and doesn't have wooden school desks. The woman taking orders was friendly and could tell it was my first time there. We chatted a bit about hot dogs, and she asked about my favorites. She promised that Hot Dogs & Brew would be my new favorite. 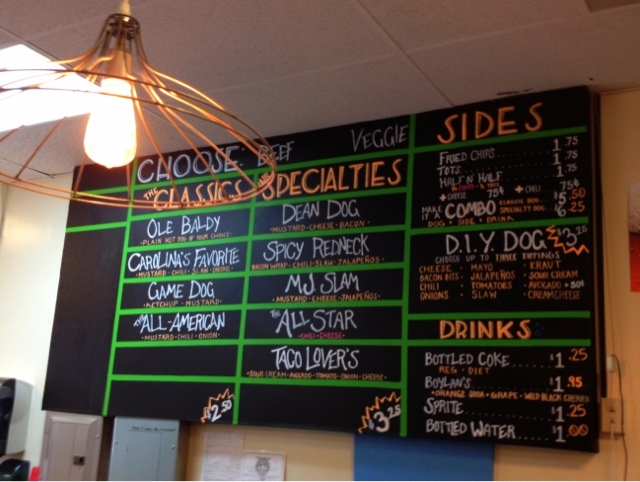 The menu is a colorful chalk board with several "specialties," including one called Carolina's Favorite: mustard, slaw, chili, and onions. Of course I ordered one of those, and I had to try the Spicy Redneck: bacon, jalapenos, slaw and chili--as well. I took a seat and waited for my dogs to arrive. After a bit, the woman who took my order delivered my dogs to my table. They looked good. In fact, thinking about them today makes me hungry again. I tried the Carolina's Favorite first. The bun wasn't steamed, but it was fairly fresh, so it was soft enough. The first taste I got was sweet, and I wasn't sure I was going to like it. The sweet came from the slaw, which was not homemade, sadly. The chili and onions, though, almost made up for the slaw. It was a darn good hot dog. I'd have it next time without the slaw--unless they take my advice and make their slaw fresh daily. Like the Carolina's Favorite, the Spicy Redneck suffered from the slaw. Otherwise, the chili, bacon, and jalapeno were tasty combination. The prices are a little steeper than most, in keeping with the prime location: $2.50 & $3.25. Good for the expected lunch and dinner, but I'm betting most of their business will be late night; they're open until 3AM on weekends. All in all, Hot Dogs & Brew has pretty good hot dogs. They could be great with a little freshly made coleslaw. My verdict: 4 weenies out of 5. UPDATE: Sadly, the lack of homemade slaw may have done them in. This hot dog stand is history. By chance, driving along Chapel Hill Road this afternoon, I noticed a new hot dog business, Citidogs, in the former Dog House location at The Shoppes at Lakewood. I was actually on my way to check out another hot dog venue in Durham and decided to change my plans. Apparently, this location has been open for less than a week. Business seemed moderate. A couple of folks in front of me had ordered, and several arrived shortly after me. However, I'm not sure what the future holds for Citidogs. As you'll see, it's not one of my favorites. Dog prices aren't bad at 1.50 per hot dog, including the toppings. They also offer a special: 2 dogs, fries, and a beverage for 5 bucks. I prefer my hot dogs with slaw and onions in addition to the mustard and chili, but sometimes I find that pre-packaged slaw (slaw that is not freshly made) can distract from what might be a decent dog without the slaw. Some folks call the dog with mustard, slaw, chili, and onions a combo dog. Others call it an all the way dog. Others understand all the way to mean mustard, onions, and chili. Perhaps the easiest way to name them is with cute-ish names as they do at Citidogs. However, I saw no combo dog on the menu, so I chose one Northside (mustard, onions, chili) dog and one Eastside (mustard, slaw, and chili) along with my usual diet Coke. It wasn't. 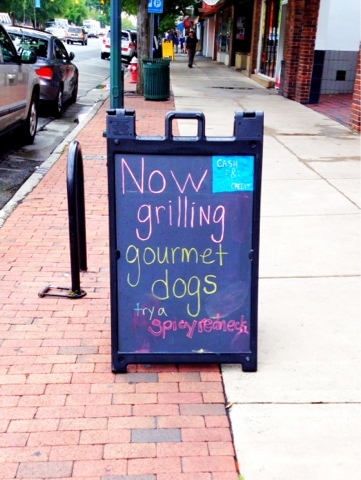 Sadly, it made the Northside dog better. The slaw as prepackaged and very sweet. That sweet combined with the sweetness of the chili made me debate whether to even finish the dog. I did, and I wished I had not. The only thing I could say for either was that the wiener was not to blame. They looked and tasted as if they had been grilled, and it had a bit of char on them. If I were ever to eat here again, I'd opt for a naked dog, perhaps with just mustard and onions... but there are definitely better dogs to be had. My verdict: One and one-half weenies. UPDATE: The public agree. This hot dog stand is history. One of my plans for this blog was to feature entries for dearly departed hot dogs… hot dog businesses I fondly remember and wish were still around. No such entry would ever be complete without the legendary Amos ‘N Andy. Although I probably ate there more before I can remember, I only have memories of three times. Oddly, those three were at three different locations. The first was what I assume to be the original at the site of the current Durham Marriott. As I recall, it was a long room with a counter on the left. The man preparing dogs would line them up side-by-side along his arm… I assume he had clean arms. He had topping the dogs down to a science. The second Amos ‘N Andy location I visited was on NC 55 heading out of town. This additional location was a stand-alone building that remains today, but it has been a combination of numerous establishments, as well as vacant, since that meal back in 1972. I remember the year because “Stuck in the Middle With You” was on the juke box. The last time I had an Amos ‘N Andy dog would have been in the late 70s or early 80s. By that time, the original location had moved closer to Five Points on Main. The hot dogs were as good as ever, and they’re really the standard by which I judge a hot dog these days—however, fair that may be, considering time and romanticism may have made them even better in my mind… but I don’t think so. Endangered Durham used to have a picture of the business, but it has either been taken down or put behind a firewall. If I find it again, I'll post the link.